We all deserve second chances, and that’s why I’m a partner with Defy Ventures of Colorado. This nonprofit organization was founded in 2017, and assists incarcerated individuals cultivate the invaluable skills they’ll need for life outside prison. Through extensive community outreach and mentorship programs with top executives, Defy encourages Colorado’s incarcerated population to develop business savvy and achieve emotional healing. Individuals enrolled in the mentorship program are known as Entrepreneurs in Training, or EITs. 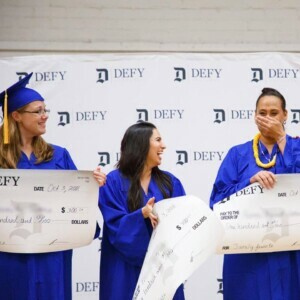 Since the organization’s inception, Defy has helped more than 80 EITs graduate from the program and launch a career after release. The EIT program is rigorous, and requires hours of mentorship, classes, and personal growth. Each enrollee works closely with a local mentor, and upon graduation, the graduate will receive a certificate from Colorado State University’s Business Institute for Entrepreneurship. Graduation is the culmination of hard work and determination, and each graduate will have the opportunity to present a business pitch at the ceremony. The Defy Colorado graduation will be held at the Dairy Arts Center on Wednesday, April 24 from 12:00-1:30 pm. At this capstone event, attendees will have the opportunity to participate in a panel with Foundry Group, Techstars, and Google. The panel’s focus is on the power of transformative change, and will set the tone for the culmination of the event: the presentation of the graduates. Each graduate will present a pitch to the audience, which will challenge the attendees’ perceptions of the incarcerated and formerly incarcerated populations. Bring your appetite to this event, as lunch will be provided by T/aco. The ceremony begins at 12:00 sharp, and RSVPs are required; please visit this site to make a reservation. Defy does important work in destigmatizing the perceptions associated with having a criminal history. Second chances are part of life for most of us, and we believe that formerly imprisoned individuals should have the same opportunity for growth. To learn more about Defy Colorado’s mission and impact, check out this video. Volunteers, mentors, and donors are always needed; visit Defy’s site to learn how you can help. Donations are tax deductible, and will go a long way toward providing curriculum, supplies, and scholarships to Defy’s Entrepreneurs in Training. We hope to see you at the graduation ceremony!